more characters and returns a new chapter of my comic. Brother Z: Thanks! I guess she only like gummies like Bro B does. Joey: Obed, how do you like the new Banana Pants FlipDeck? Ode: Hey, Flaky! Since I'm a total spicy food fanatic, I've gotta ask. What's the spiciest food you can stand? Michelle,which fc of mine do you want to meet? Family Relationship: Elia Akahoshi Castillo (Adoptive Mother), Flaky and Candy (Step sisters), Karnage (Brother), Joy "Chica" (girlfriend). He is a clever, intelligent and positive young man. 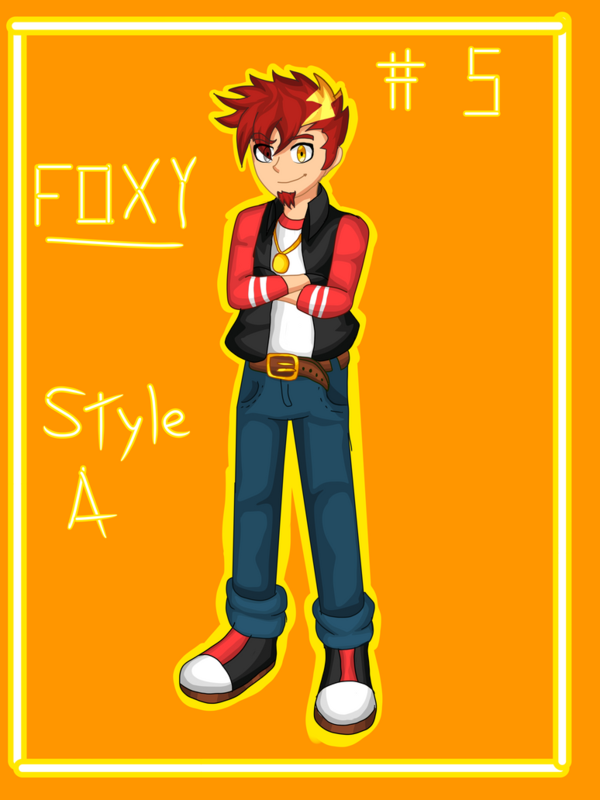 It has an eye of amber orange, and a gray one, that eye implies that he, although he transforms himself into a fox man, has a virus called by the scientists "Nemesis"
Foxy was separated from his brother after his parents sold them to mercenaries for "economic" reasons of their parents. He suffered too much abuse and was injected by a virus called "Nemesis type-a" created by a bioterrorist, he was going to be a deadly weapon for humanity, he turned out to be compatible with the virusa difference that kidnapped children and youth but resulted being a failure, they were not compatible and they became beasts that satiate on human flesh. He was rescued by an adventurer and archaeologist named Elia, he was too scared but as the days passed he loved her too much that he started calling her "Mother" and Flaky and Candy as his blood sisters, although his brother is missing but He knows he is alive. Foxy since then decided to protect his Mother, Elia, and his sisters against any enemy that intends to harm them and not forgive them. Azariah: Foxy, how often do you go surfing? Brother E: Bump! Are questions still going?